There is NO COMPARISON between HOME MADE BISCOTTI & STORE BOUGHT BISCOTTI. Believe me if you haven’t already experienced this, try this recipe just once to experience the difference. My good friend and past VSI guest, Ruth, recommended Mark’s book to me. She said that is the only cook book that she takes with her when she sojourns for several months to Provence, France, with her husband, and wondrous Standard Poodle every year. So, of course, I had to buy it. I’ve well used mine however my other favorite cookbooks are: the older version of the Joy Of Cooking by Rambauer, Becker (I received mine for my wedding in 1958), The New York Times Cookbook by Craig Claiborne (1961 is my version), Ann Seranne’s Good Food With a Blender (1974) book, and Soups & Stews (Better Homes and Gardens(1993). The latter has a great recipe for “Mexican Chicken-Tortilla Soup” among other good ones. Cookbooks are so special and tell a history of your family. I know my Mother used the Ritz Hotel and Good Settlement cookbooks a lot. I still have them and what a hoot. 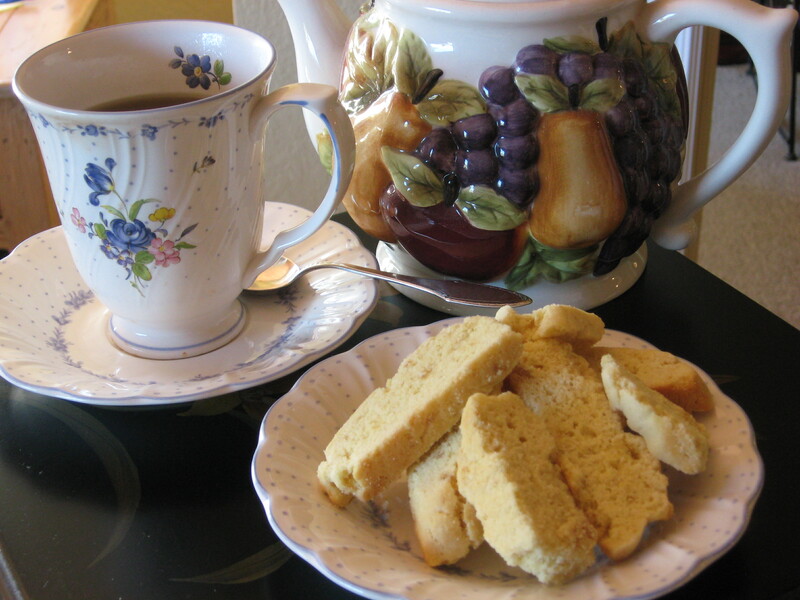 I do like these biscotti a lot, plus they are so simple to make. I have altered Mark’s recipe a bit to make it easier. They really don’t take any time to make, except for the baking part. Who cares when they are so yummy and when your guests will throw compliments galore your way? On 2 baking sheets, place parchment paper. Use an electric mixer to cream together the butter and sugar until light and fluffy; beat in the eggs, one at a time, then add the vanilla or almond extracts. Sift the flour and baking powder in a bowl and add the ¼ C. minced crystallized ginger to the dry ingredients. Add the dry ingredients to the batter a little at a time. I continued to use my beaters for this. Divide the dough in half and shape each half into a 2 inch-wide-log. Place each log onto one of the parchment lined baking sheets. When the loaves feel firm enough and cool enough to handle, (in about 5 minutes) remove them to a paper towel placed on a flat surface. Cut each on the diagonal into ½ inch thick slices, using a SERATED knife. Place the slices back on the baking sheets still lined with your parchment paper. Return the slices to the oven in the 250 degree oven to dry out. Bake them on one side for 10 minutes, turn them over, and bake them another 10 minutes. These will keep in an airtight container for several days. 1 tsp. ground fennel or anise seeds; or one tsp. ground cinnamon to the dry ingredients. Stir one C. slivered blanched almonds; roasted and chopped hazelnuts; whole pine nuts; or other chopped nuts in prepared dough before baking. Melt 8 oz. semisweet chocolate with 3 Tblsp. unsalted butter. Spread this mixture onto one side of the biscotti when done. Cool on rack until chocolate coating is firm. Mix about ¾ C. chocolate chips into dough before baking.